Blame it on Miss Dahl's Voluptuous Delights, a cookbook by the gorgeous, curvaceous former model Sophie Dahl. I chanced upon her book while browsing at the library last week. It is a pretty cool cookbook/food memoir, full of charming little anecdotes and homely recipes which I thought I might get round to trying someday. I believe it is difficult, if not impossible, to find another word in the English language which so singularly and immediately conveys a sense of supreme, lip-smacking yummaliciousness (see, I needed to use 3 words, told ya). Once planted in my head, it simply refused to leave me alone. On and on, like a chorus of inebriated Oompa Loompas, the refrain of "Scrumdiddlyumptious scrumdiddlyumptious scrumdiddlyumptious" played on my mind for the rest of the week. You can understand of course, that it was only a matter of time before I was seized with the irresistable urge to make, and consume in large quantities, something truly and marvellously scrumdiddlyums. It wasn't hard to decide what would fit the bill. It had to be Fudgey. Creamy. Buttery. Sweet. There would have to be Chocolate. Peanut Butter. And Marshmallows. And most importantly, it would not be healthy. The last being not so much a requirement as it is a matter of fact. For scrummy and healthy never the twain shall meet. And that's how the Fudgemallow Pie was born. A fudgey chocolate brownie pie, spread generously with the smoothest, butter-creamed peanut butter, topped with coconut flakes and big fluffy marshmallows. And then smothered all over with warm chocolate sauce. The sensation of melty, chocolate-coated marshmallows against the salty-sweetness of creamy peanut and coconut on fudge, is out of this world. When you take your first bite, your brain will exclaim in sugar-induced ebullience, "By golly, this IS Scrumdiddlyumptious!!". And then scarcely after recovering from the shock of its intense, chocolatey, fluffernutterish deliciousness, it might scream "MORE!!!". Or in my case, "This needs ice-cream!" Which of course it does. Cold creamy, vanilla bean ice-cream melting atop its warm, oozey, chocolatey, stick-to-the-roof-of-your-mouth fudgey goodness. You cut yourself another slice. And then after 5 minutes, you realise this was indeed rich. Very rich. And that it might be wise to stop. Now. As you perhaps recall gluttonous Augustus Gloop's ignoble end in Charlie and the Chocolate Factory. But then your tastebuds override your better sense and you launch yourself into another serving. SCRUMDIDDLYUMPTIOUS!!! Preheat your oven to 325 degrees (163C). Butter an 8-inch round glass pyrex pie pan (or any pan that you can cut on and serve from). Sift together the flour, cocoa, baking powder, and salt. In a double boiler over hot water, carefully melt the butter and chocolate, stirring to mix. In a large bowl, whisk the eggs, sugar, vanilla, and sour cream together. Add the melted chocolate and mix completely. Fold in the flour mixture and stir only until the batter is uniformly brown. Pour the batter into the prepared pan. Bake for 30 to 40 minutes, just until the batter is set and no longer jiggles when touched. Do not overbake; it should be moist and slightly gooey. Mix the peanut butter and butter together until smooth, shiny and uniform. Combine and gently melt chocolate and butter in a double boiler. Add golden syrup and dark rum and stir through. Sauce should be thick but pourable. If too thick to pour, add more butter. Spread peanut butter mix onto fudge pie base. Sprinkle coconut flakes over. Dip each marshmallow quickly into chocolate sauce and 'stick' it onto the pie until you have an entire layer of marshmallows. 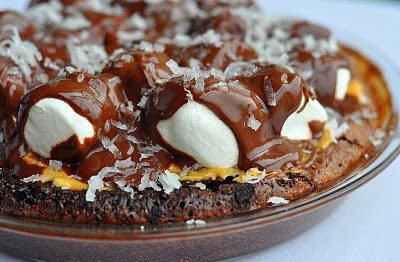 Sprinkle with more coconut then pour chocolate sauce over until marshmallows are covered. Garnish with remaining coconut flakes. Whoa, this looks just as rich as you described. The brownie looks amazing though. OK, you've got me hooked. I have to try this, yum. Oooooh this looks SO sinful and SO delicious. There goes my diet!!! Lol your peanut butter photographed yellow and I thought it was nacho cheese at first glance and was grossed out! @Jessica: Oh man, you are right it does look like nacho cheese!!! LOL! The butter added to the peanut butter does turn it yellowish I guess!